In stock -This product will ship today if ordered within the next 11 hours and 9 minutes. Rosehip Oil Light Blend is a balancing beauty oil to help regulate oil production and improve skin tone, fine lines and wrinkles, promoting radiantly healthy skin. This easily absorbed seed oil blend is light on feel, yet deeply nourishing. Essential fatty acids from rosehip & cranberry oil combine with vitamin-rich jojoba oil to nourish and repair without clogging the pores while tomato seed oil provides antioxidants to protect against environmental damage. Grapeseed oil rich in omega 6, and cococaprylate, an emollient oil derived from coconut, provide a light consistency and silky feel on the skin. Rosa Canina (Rosehip) Seed Oil, Simmondsia Chinensis (Jojoba) Seed Oil, Vitis Vinifera (Grape) Seed Oil, Coco-Caprylate, Solanum Lycopersicum (Tomato) Seed Oil, Vaccinium Macrocarpon (Cranberry) Seed Oil. After cleansing massage 2-3 drops into face, neck and décolletage. Use morning and /or night alone or in conjunction with your regular moisturising products. To ensure compatibility it is recommended that you patch test before use. In the unlikely event of a negative reaction, discontinue use and consult your medical professional. 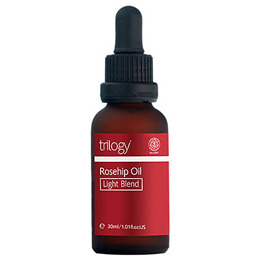 Below are reviews of Trilogy Rosehip Oil Light Blend - 30ml by bodykind customers. If you have tried this product we'd love to hear what you think so please leave a review. 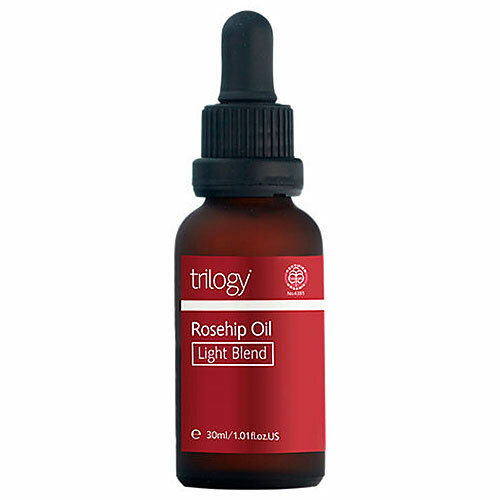 Rosehip Oil Light Blend is a balancing beauty oil to help regulate oil production and improve skin tone, fine lines and wrinkles, promoting radiantly healthy skin.